UN Women Bangladesh together with the Embassy of Sweden here hosted a photo exhibition and panel discussion titled “Swedish Dads and Bangladeshi Babas (fathers)” at Zainul Gallery in the Faculty of Fine Arts of Dhaka University on Saturday. 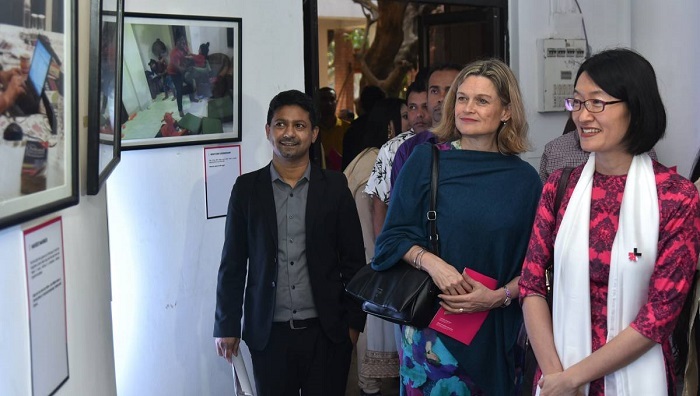 Swedish Ambassador to Bangladesh Charlotta Schlyter and Country Representative, UN Women Bangladesh Shoko Ishikawa jointly inaugurated the exhibition that will continue till Sunday, said a press release. The exhibition is showcasing photos of Swedish photographer Johan Bavman and photos of Bangladeshi dads in caregiving roles. Photos were selected from a process that involved a call for photos from all over Bangladesh. The Swedish Ambassador said that the photos being exhibited here are showing the universally valid, loving aspect of parenthood and hoped to inspire more men to begin reflecting on their roles as fathers and partners, which is an important step towards a more gender-balanced society. “It’s good to see these stories going out into the world, where the Swedish perspective on gender equality is by no means self-evident,” said Charlotta Schlyter. Shoko Ishikawa said UN Women believes that engaging men in the discussion on gender equality and having dialogues with them to break gender stereotypes and turning them into advocates of change is the best way forward. Panelists at the discussion, Counsellor at the Embassy of Sweden here Anders Ohrstrom, standup comedian Naveed Mahbub and Category Head of Hair Care at Unilever Bangladesh Zaheen Islam spoke about the role of men in caregiving, policies that can help men attain parental leave and the ideal environment that encourages co-parenting.